Traffic engineering in Lenteng Agung area, Jagakarsa, South Jakarta is proven to effectively parse traffic congestion. Moreover, every day, there are 16 officers alerted to manage the traffic in the area.
" 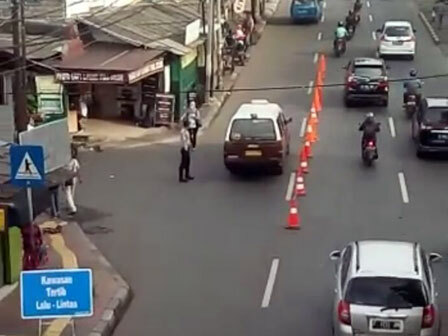 Since it is applied, traffic in the location is relatively more smoothly"
According to Eko Prabowo, Head of Executing Unit, Jagakarsa Sub-district Transportation Sub-dept., officers continue to banish public transportation that pick up passenger near the Lenteng Agung Station. It aims to smoothen traffic flow. "Since it is applied, traffic in the location is relatively more smoothly," he expressed, Wednesday (3/14). He explained, in the field, public transportation is directed to pick up passenger on the far left lane. If they still do the same thing, they will get strict sanction. "Every day we can control 10 vehicles," he told. Based on monitoring results in the field, traffic in Lenteng Agung area is relatively smooth. Some officers are seen managing traffic at some points, especially at each meeting point of the vehicle. As a result, the place is clean from public transportation.